However, so that their fans don’t have to wait half-a-year for the next sale, the Spanish-based fashion house has added a couple extra markdowns throughout the year. Albeit these sales are much smaller in scale than the multiple price drops you see with their huge Spring/Summer and Fall/Winter sales. That said, they’re still worth checking out. You can snag some good deals (just not “great deals”) during these smaller markdowns. The most recent example of this is Zara’s new “Mid-Season Sale” that started on March 15th, that’s several days before Spring officially started (March 20, 2017). During this sale, you can get some choice warm-weather gear for up to 50% off retail price for “selected items in-store and online”. As you well know, Zara’s full price is already much more reasonable than most retailers in the same category (and usually with much better quality). 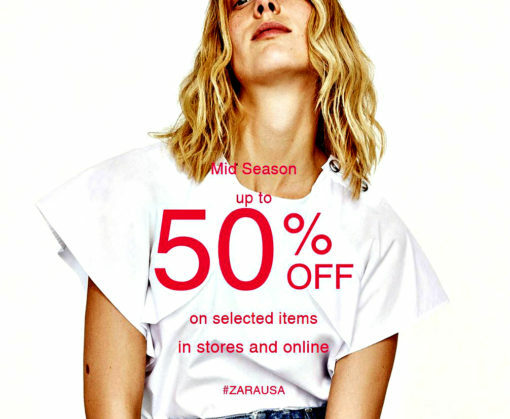 With the new Mid-Season sale, we don’t have to wait a half-year for even-more affordable Zara clothing. We can now add March as a future date to keep an eye out for discounted designs from Zara. When does Zara’s 2017 summer sale begin? Zara’s summer sale comes to U.S. (and we called it!) With Zara sale in U.K. and Ireland, is U.S. sale coming tomorrow?